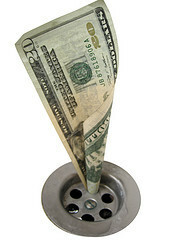 Your old toilet is flushing money down the drain. Photo credit: Images_of_Money on Flickr. CC License One of the biggest water wasters in the home is the toilet. This is especially true in the older homes in Buckhead and Intown Atlanta neighborhoods. Depending on the vintage, and older toilet can use 3 to 8 times more water than newer low-flow toilets. Of course, regardless of the money, using less water is the right thing to do, and is an important step if you want to have a green home. But I'm sure there are some number crunchers out there who are asking where the break-even point is on the expense of replacing your toilets versus money saved in water bills. What if I told you one could replace their toilets for free? Well you can. For a few years now, the city of Atlanta and other local municipalities have been offering rebates for replacing your old toilets with new, high-efficiency toilets. Recently Home Depot dropped the price on their Glacier Bay model N2316 to $98. This model qualifies for a rebate of $100, making it essentially free. You can get up to 2 rebates per household. If you have basic DIY skills, replacing a toilet is pretty simple. If you're not the handy type, feel free to contact me and I can recommend some good plumbers in the area. Though these efficient toilets use considerably less water, the newer models flush just fine. This particular one has a flush rating of 10 out of 10. There are many other models that qualify for the rebate, you can find a full list here. The toilet must be WaterSense Certified, which means it uses an average 1.28 gallons per flush or less. We opted for a dual-flush model, which uses 1.1 gallons for the "little" flush, and 1.6 gallons for the "big" flush. Most find that the "little" flush is sufficient the vast majority of the time, making the dual flush models even more efficient than the 1.28 gpf models. Now, the next issue is what to do with your old toilets. Though the North Georgia Water website is pretty informative about the rebate program itself, it's not as helpful on how to recycle old toilets. My first inclination was to donate it to Habitat for Humanity or similar charity. Turns out, they don't want the old water-wasting toilets, either! Though they're perfectly functional, it seems their only value is in their porcelain. After some phone calls, I found out that many of the charities that were listed on Earth911.com as accepting porcelain donations actually don't. Eventually I found this page on the Atlanta Watershed site. These are industrial businesses that recycle porcelain. Though they are used to dealing with multi-family projects that are recycling a large number of toilets, they will accept toilets from homeowners, too. The odd thing is that, although they will presumably be making money from recycling your porcelain, you have to pay them for the privilege! Regardless, the cost is small, and you'll have the peace of mind of knowing they're being recycled. So go and replace those water-wasting toilets. At this price, you no longer have an excuse. The rebate will last until funds are depleted, so don't procrastinate any longer!